Windows 10 SmartScreen protect you from downloading or installing malware ,The solution is simple to customize Smart Screen in Windows 10! The Windows-10 SmartScreen Filter is a useful feature that was previously developed for Internet Explorer 11, which helps you recognize phishing sites. The smart-screen can also protect you from downloading and/or installing malicious software, SmartScreen ist extended a Filter on Windows 10. The Smart-Screen Settings in Windows 10! And now click the text Change Windows SmartScreen settings and customize or turn off the Windows 10 SmartScreen. 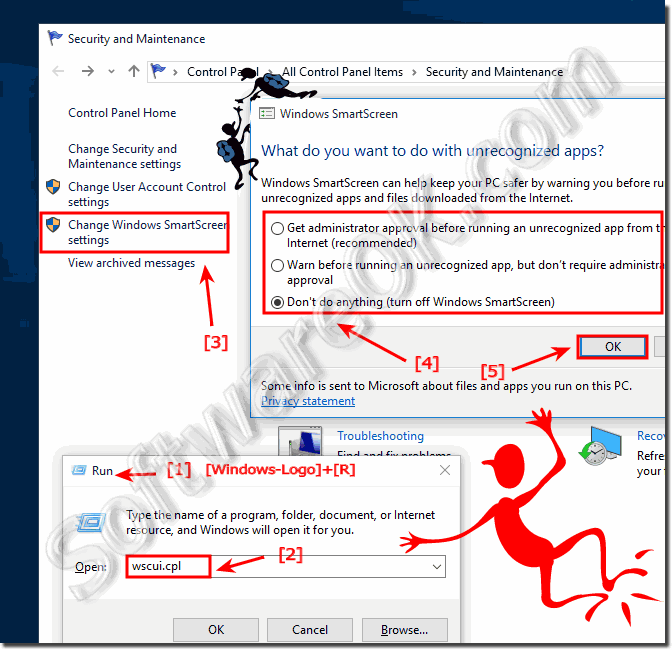 (Image-1) Windows-10 and Smart Screen settings! When you download a program from the Internet, Windows-10 SmartScreen Filter will check the program against a list of programs that are downloaded by a significant number of other Internet Explorer users and a list of programs that are known to be unsafe. If the program you're downloading isn't on either list, SmartScreen Filter will display a warning that the file isn't "commonly downloaded." It doesn't necessarily mean the website is fraudulent or that the program is malware, but you probably shouldn't download or install the program unless you trust the website and the publisher. Open Personal Files Folder in Windows 10 current and all user, how to? Disable Windows 10 Smart Screen? Disable Windows 10.11 Smart Screen? Command bypass smartscreen windows 10? Smartscreen windows 10 enable exe? Command prompt bypass smartscreen windows 10? Smart screen customizer win 10?